Many famous tour professionals use the B330 range but there are a large number of amateur players keen for a ball with tour like characteristics, thus the B330-RX was born for those golfers with a swing speed of 170 kph and below. This ball is the softest multi-layer golf ball on the market, providing accuracy and consistency for the amateur. It has a soft core and cover; it is really worth a try, particularly for anyone who has never settled on an ideal ball and is still looking for consistency of performance. It has the main features of the B330 Range with dimple design and B330 technology.The B330 Range has certainly established itself in the market and the world of golf is improved as a result. The B330 RX comes with the support of a brand name that has grown in recent years; Bridgestone actually produced golf balls in Japan in the 1930s and is still the brand leader in Japan. 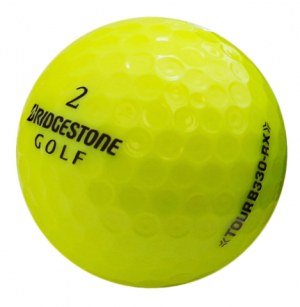 The RX has certainly reinforced that amongst the amateur ranks and every ball that is sold here at Lost Golf Balls has to pass our stringent inspection so that when it reaches our customers it brings all the qualities expected of a Bridgestone golf ball.